What is Home Based Primary Care? 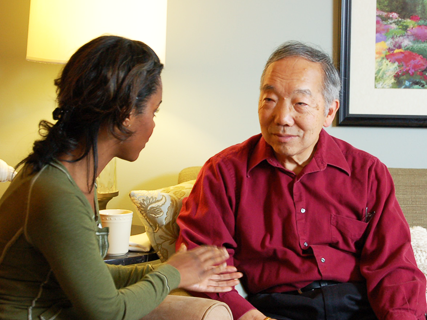 Home Based Primary Care is health care services provided to Veterans in their home. A VA physician supervises the health care team who provides the services. Home Based Primary Care is for Veterans who have complex health care needs for whom routine clinic-based care is not effective. The program is for Veterans who need skilled services, case management and help with activities of daily living. Examples include help with bathing, dressing, fixing meals or taking medicines. This program is also for Veterans who are isolated or their caregiver is experiencing burden. Home Based Primary Care can be used in combination with other Home and Community Based Services. Watch the video to hear what Home Based Primary Care providers, the Veterans they care for, and their families have to say about this program. Am I eligible for Home Based Primary Care? Since Home Based Primary Care is part of the VHA Standard Medical Benefits Package, all enrolled Veterans are eligible IF they meet the clinical need for the service and it is available. A copay for Home Based Primary Care may be charged based on your VA service-connected disability status and financial information. You may have a basic copay each time a VA staff team member comes to your home for a medical visit (the same as if you went to a VA clinic). Contact your VA social worker/case manager to complete the Application for Extended Care Benefits (VA Form 10-10EC) to learn the amount of your copay. Your physician or other primary care provider can answer questions about your medical needs and whether or not you may be eligible for Home Based Primary Care. Your VA physician or social worker can tell you if a Home Based Primary Care program is available in your area. You can also use the Locate Services and Resources page, found on the left navigation menu, to help you locate Home Based Primary Care services. I have lots of problems related to my diabetes and it's difficult for me to get to clinic appointments. The VA sends a nurse, a dietitian and a physical therapist to my home to help me. After my husband came home from the hospital a nurse came out to our home to make sure that things were going all right and that we could manage his heart failure. She is helping us to get a visit from a dietitian who can help us learn how to reduce his salt intake and the nurse practitioner will be coming back on a regular basis to check on him to see how he's doing. We live in such a rural area that it's a blessing that they come to us.